Mesut Özil is not fit enough to play at Arsenal. He has had a terrible season. He's hardly scored any goals for us. He looks disinterested. Why are we not resting him? Is he worth the record-sum we paid? The above statements/questions are being asked by many Arsenal fans after yet another disappointing result, whilst the whole Özil debate has been on many people's agendas for quite some time. Yes, he missed a penalty yesterday that would unquestionably have given us momentum and confidence to put Bayern firmly in their place. He's also missed a few before. But, the best players miss them. David Alaba missed his against us in the second half. We also seem to forget that it was Özil that won us the penalty in the first place. The German international's stats for last night's game may highlight a lack of completed passes (and interceptions of Bayern's), but they also reveal that he covered more distance than all but Flamini and Jack. People who have a keen eye will notice that Özil simply moves around the pitch in a gracious, somewhat floaty manner, which makes him appear to be lazy, slow and disinterested. When you pay more attention you notice that more players mark him than any others, which in turn opens up the field for more passing opportunities to be exploited. And I have no doubt that this would have been demonstrated if it weren't for the extra man that Bayern had. The one thing I'd like to know about Özil is whether he has a minimum-minutes-per-game or minimum-games-played clause written into his contract, because he seems to be playing every game and is rarely subbed-off. I still think he needs a bit of a break (not against Bayern though), both physically and mentally - perhaps there is increased position competition in the German squad and he (and Wenger) wants to be involved at every opportunity to stay top of the priority list? Anyhow, the clash against Bayern was a huge disappointment, especially given the way in which we started the game and the opportunities we failed to convert. BUT, we go to Munich with a far better chance than we had last season - we 'only' have a two-away-goal deficit to face up to, we have a better team than we did last season, we will (hopefully) have momentum in the Premier League and FA Cup to transfer to the Champions League and, let's face it, the reigning European champions will know and fear that we have unfinished business with them. We've beaten them before, we can do it again. With that match-related stuff out of the way, I can tell you more about the craziness that is Indonesia. 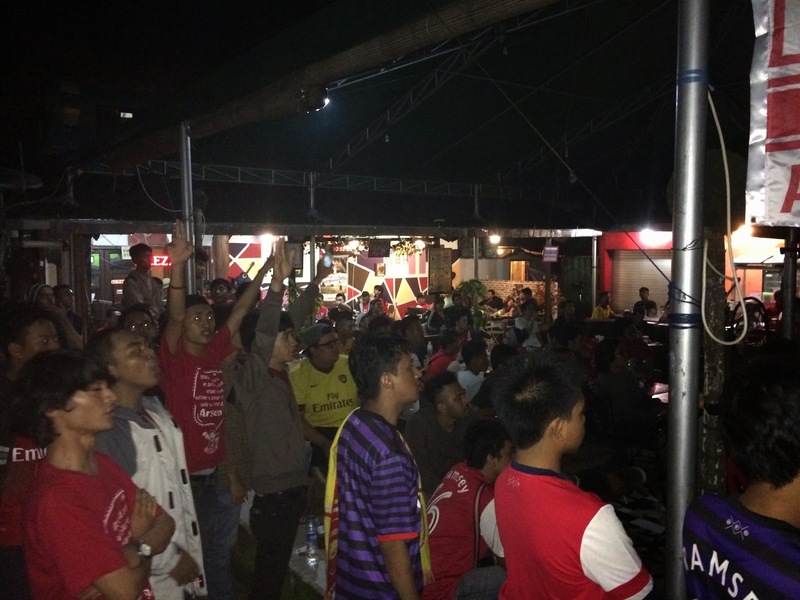 I watched the game with the local Arsenal fans at Warung Bang Hoody, an open-air venue in South Jakarta and the home base of Arsenal Indonesia Supporters Jakarta. Being a 2:45am kickoff, it was always going to be difficult to get a good bunch of fans together (they had more than 1000 Arsenal fans in attendance here for the Carling Cup Final implosion against Birmingham) but we still had around 150 Arsenal fans in attendance, not to mention a good number of Bayern supporters. Jakarta itself is quite simply the craziest place I have ever been, it's a huge departure from anywhere else I've travelled. The sheer amount of traffic is ridiculous and the number of suicidal motorcyclists darting in and out of traffic is mind-boggling. People obviously have a far lesser interest in their own safety over here. In fact, the taxi ride alone from the airport was the most intense fairground ride I've ever been on. And at least fairground rides have seat belts or other harnesses, the taxi I was in had none. 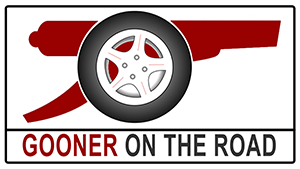 I'm quite sure the driver was about fourteen, and with his complete disregard for other road users, pedestrians, passenger comfort and wildlife, I was happy to arrive at my destination in one piece without the need to change my underwear. I suppose you can't really argue with a £10 taxi-ride that lasts two hours. All that doesn't matter too much though. I'm here to see the Arsenal family, and the Indonesian fans that I've met so far have been utterly devoted to making sure that my stay is as comfortable as possible. They are incredibly proud of their supporters clubs and the passion that they show for Arsenal surpasses that of any other groups I have seen so far on my journey. I'm sure it'll continue to amaze me when I'm in Bandung, Western Java, to watch the Sunderland game at the weekend. Until then.